The former EMI record factory and recording studio was first established in 1926 as the Columbia Graphophone Company, an Australian venture of this British based record company. The building, which still stands on the corner of Parramatta Rd and Columbia Lane, was originally built in 1921 by Gold’s Hosiery Mills Ltd. In 1922, a private lane was built adjacent to the factory called Golds Lane. This was later transferred into public ownership and renamed Columbia Lane in 1926. In 1924, Gold’s Hosiery went into bankruptcy. The site was purchased by Columbia Graphophone for a record pressing plant and recording studio in 1925/26. Columbia Graphophone was the Australian subsidiary of the British owned company. The recording studio and record pressing plant was opened in 1926. The official opening took place on 14 October 1926 by the Governor of NSW Sir Dudley de Chair. The Columbia Company has just released the first record not only pressed, but actually recorded at the Homebush factory near Sydney, and consisting of two items played by Sydney Simpson and his Wentworth Cafe Orchestra: the popular, ‘After the Dawn’ waltz by Jack F. O’Hagan, and a fox-trot “Freshie”,’ both with a vocal chorus (Col. 0514). It is claimed that the product is entirely Australian, for “After the Dawn” has been composed, performed, recorded and pressed by Australians. This waltz with a captivating swing, which explains its increasing popularity, has been quite satisfactorily recorded, its only weak spot being the nasal quality of the ‘singer’s voice, who sings the vocal refrain. However as long as the record serves its principal purpose, dancing, mediocre vocal quality matters but little’. The recording studio operated at Homebush until 1954 when it was transferred to EMI’s studios in Castlereagh Street Sydney. Many famous recordings were made at the Homebush studio including ‘Our Don Bradman’ in 1930 and Sir Charles Kingsford-Smith’s recollections of the first direct flight to Australia in 1928. Columbia Record by the Pacific Flyers. A living photograph of Squadron-Commander Kingsford-Smith’s and Flight-Lieutenant Ulm’s voices-their inspiring messages to their fellow Aus tralians is now available in every home throughout the Commonwealth. These two interpid aviators, by means of an electrical recording apparatus the only one of its type in Australia have had the pleasure of making the following record: “The Trans-Pacific Plight of the Southern Cross, Part 1, Kingsford Smith’s story and Part 2, C T. P. Ulm’s story.” The Columbia Graphophone Company of Homebush, Sydney, had the honour of recording these two wonderful, realistic stories of an epoch making flight. Here is an opportunity to secure a souvenir of their own voices. Each speech is a spontaneous expression of their experiences on the Trans-Pacific flight. In 1929 during the Federal Election campaign, political leaders such as Prime Minister Stanley Bruce and Billy Hughes recorded their election speeches at Homebush. Photographs of this event are held at the State Library of NSW. The Homebush studio recorded many thousands of Australian performers including Slim Dusty and Gladys Moncrieff. The Homebush plant was the local manufacturer of many overseas recordings including soundtracks for musicals from film studios such as MGM and Paramount. ‘Columbia Lane’ was the title of Slim Dusty’s final record in 2003, a reference to the address of the former EMI recording studio at Homebush, where he made his first record in 1946. During the Great Depression most record companies either merged or folded as economic conditions dramatically deteriorated. In 1931, the British Columbia Gramophone Company came under the ownership of EMI [Electrical & Musical Instruments] together with the labels: Grammophone Company, HMV and Parlophone. A low budget label, Regal Zonophone was established. Through owned by EMI, the Australian business continued to be known as Columbia Grammophone. During the 1930’s Depression, the EMI was one of the only record producers that survived the Depression and for many decades was virtually the only record producer in Australia. In 1935, Homebush Council approved a second storey addition to the factory and in 1936/37, electric signs were erected on Parramatta Road and cottages built in the grounds behind the factory. In 1958, the Homebush factory was renamed EMI Records. The name Columbia continued as a record label. In 1992, the factory closed with the cessation of production of vinyl records, which were replaced by the compact disc format [CD]. A development has been approved on part of this site. As at January 2016, the original building which housed the Columbia and later EMI record plant and recording studios is still standing. 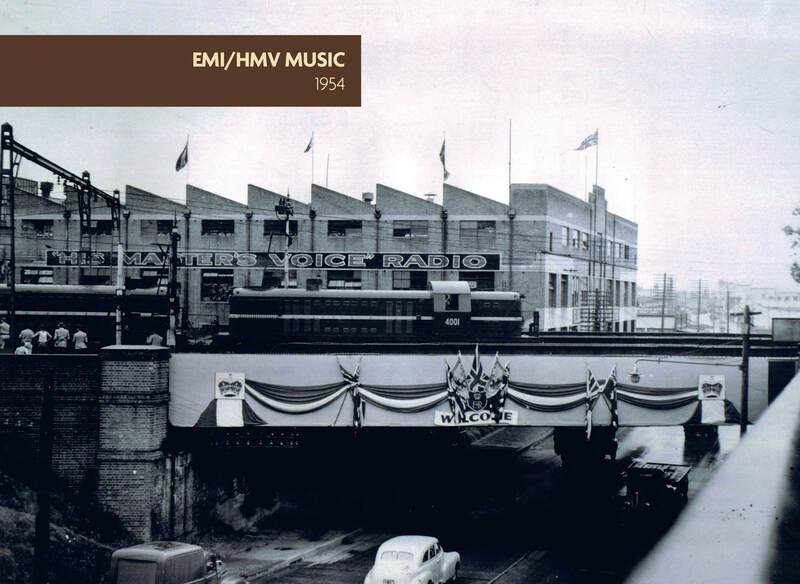 The famous EMI logo of the fox terrier dog ‘Nipper’ listening to the Gramophone is clearly visible in the large sign above the EMI Homebush factory in the picture taken in 1962. The ‘Nipper’ logo was recently voted one of the most famous symbols of the 20th century and can still be seen in the logo for the HMV music shops (which no longer operate in Australia but are still operating in the UK). Laird, R. Sound Beginnings, Currency Press, Sydney, 1999. © Cathy Jones 2004, 2014, 2016. This article is subject to copyright and may not be reproduced without permission of the author. My father worked there from approx 1956 to 1986, remember well walking around the complex with him, he even got me a job there in the EMI warehouse in early 1978. Hi Mark – I’m looking to speak to someone who worked there before it closed. Could you send me an email? eliza.barr@news.com.au. Cheers. I remember it well…I worked as a typist in the Office at Arnotts Biscuit Factory in 1958-1959! My boyfriend (now husband) worked as a truck driver for Arnottts’ during that time. Lovely memories!! A friend of mine used to get my records for me! Great days, things have changed a lot since then! But its always nice to drive down Parramatta Road & reminisce! I have an old Palings Victor upright piano that came from EMI Homebush. My daughter learned to play on it. She probably will never realize the significance.